Remember those paint-by-number kits where instructions told you what color went where and to stay within the lines? This novel activity takes that concept, and makes it a whole lot more fun. Participants create their very own masterpieces, plus get to sip on their favorite glass of wine (or sometimes beer and cocktails) for some added inspiration! Here are the 10 best spots to enjoy paint and wine in New Mexico. Unleash your inner artist. Spend an evening at this local wine and painting studio and take a step-by-step painting class under the direction of an expert instructor, and have a glass of beer or wine, too. No experience necessary and you can paint whatever you like or the painting of the day. Class price includes canvases, paints, brushes, easels and apron. Owner Kelly Jo Kuchar has been teaching people how to paint for years in this, the state’s first paint and sip studio. As an artist and ceramics designer who knows her craft, she helps people overcome their reticence to put color on canvas. Class fee includes materials and instruction. Wine and beer are available for purchase. There’s a private studio on-site and the space accommodates large groups. Looking for a unique fundraiser? This is the place! Painting, sipping and socializing is happening in the Mesilla Valley at this local social art studio. Local artists lead the classes, providing stroke-by-stroke instruction on how to create a masterpiece in one evening—that you get to take home! Adult, children and private parties for birthdays, bridal showers or just an evening out are available. Class cost includes all necessary materials; wine not included. If your creative muse kicks in, check out the open studio/walk-in instruction option. This is a night out of creativity and conversation with local artists who walk you through the steps to create an artistic masterpiece in two hours. The Paint Night community is made up of local bar and restaurant owners who connect with local artists to host local paint and sip nights. Costs vary, but include supplies and a signature apron, as does the location change. Two popular spots in Santa Fe that host these nights are the Blue Corn Cafe and the Thunderbird Bar and Grill. You don’t have to go anywhere to have a fun sip and paint night, because Saucy Paint comes to you. Whether you’re planning a private party, team-building exercise or fund-raising event, this mobile art box shows up with professional artist Tiffanie Owen and the evening gets colorful. This is also a partnership between Saucy Paint and local bars and restaurants where public classes take place. Painting supplies and equipment are covered in the price of the class. Alcoholic beverages are purchased at the host venue. Local art therapist and teacher Suki Willoughby creates a fun evening where everyone goes home with a masterpiece of their own doing. Classes are held at local restaurant Mykonos Cafe & Taverna, a relaxing and homey setting that puts all participants at ease. Wine and beer, plus a full menu of food are available. A little music, time with friends and family and discovering that painting is fun is a recipe for a great night out. Materials are included in class fee. If you like wine, this is the place in town to go to taste. Two local wineries are featured, Anasazi Fields and Black’s Smuggler. 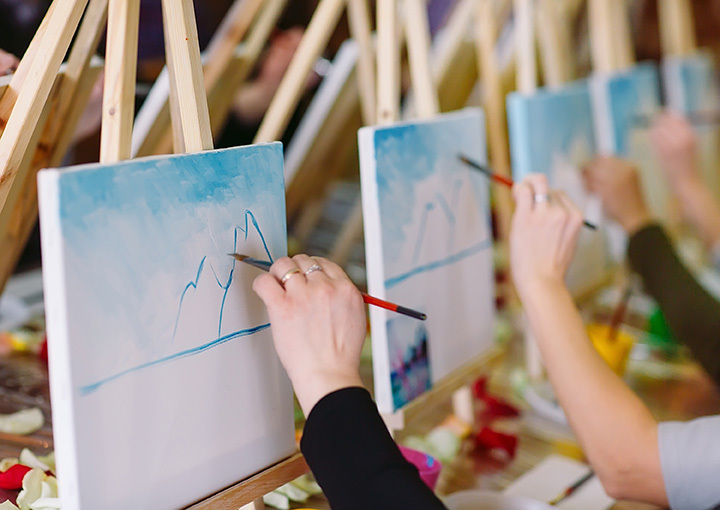 Combine your wine tasting with a painting class for a pleasant and relaxing evening. The two-hour class teaches you how to mix and ap-ply vibrant acrylic colors of paint to create a beautiful work of art. Whether you’re a beginner or experienced painter, the end result will be a finished piece worthy of hanging on the wall. Wine and painting classes are sponsored by Gallup Arts, a non-profit that seeks to “foster creativity, culture, commerce and quality of life in Gallup and McKinley County through the arts.” The class is conducted by a master artist from the community who instructs on painting basics like blending color, brush use and … how to make painting fun. Complimentary wine and snacks, plus all painting materials included in the fee. Discover your own artistic expression here! The creative expression of local artist Ashley Walterscheid translates into an entertaining evening of artistic fun for participants at one of her painting parties. This is a great way to relax with friends or family, or even meet new people. Host a private party or attend one of the events at a local winery. Classes are two to three hours and materials are included in the cost. You can choose what you want to paint and the level of difficulty. As a wine consultant, she also offers a wine shop at home party in conjunction with a private painting part. All you need to bring to this activity is your imagination. Professional artists with help you find your artistic style. In just about two hours, you’ll complete a unique work-of-art and in the process make, not just a masterpiece, but memories too. All supplies, canvas, paint, brushes and apron, are included in the cost, plus refreshments! Seating is limited so be sure to make a reservation.